This is it! 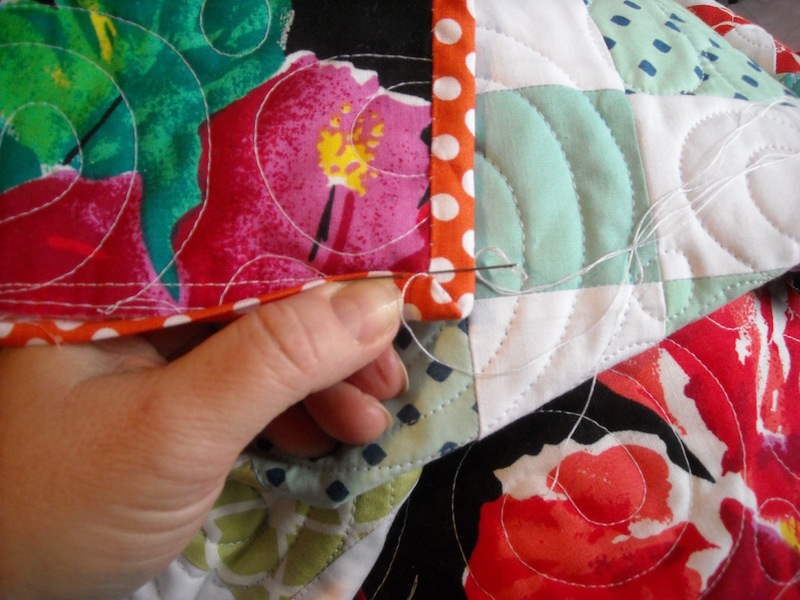 The final steps needed to call your quilt finished. So here we go . . . terrible pictures and all . . . (I was having a “bad photo” day, evidently) . . . Since my binding is scrappy, it’s difficult to pick a thread color that will go with every fabric in my binding. If this were a competition piece, I’d probably go to the trouble of changing the thread color every time the fabric changed color, but this is a usin’ quilt, so I just chose white — goes with everything. Besides, the stitches are supposed to hide anyway, and most of them do. And it’s on the back, for pity’s sake! A few noticeable white thread spots will not take away from it’s snuggliness. 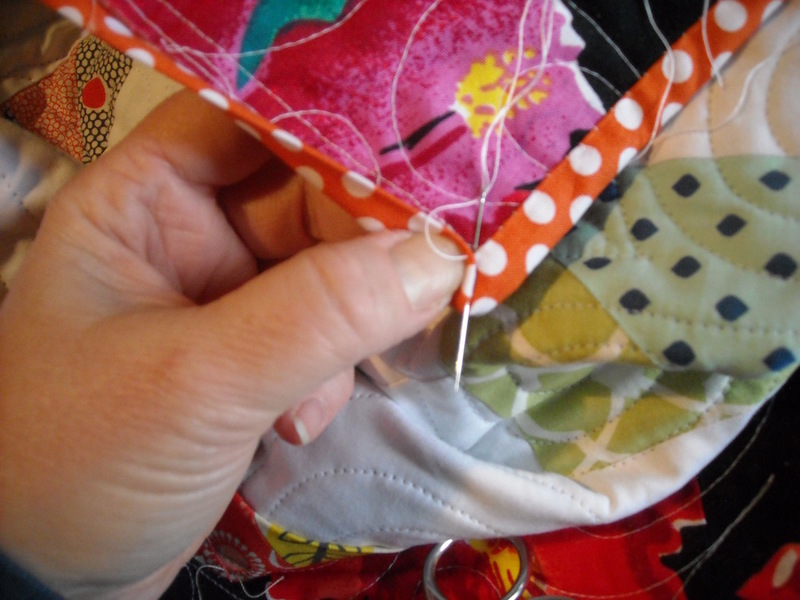 I just pick a random spot along one side, and bring my thread up through the folded edge of the binding strip where I want to start. Then I fold the folded edge of the binding over to barely cover the stitching line (from where I stitched it on the top of the quilt), and start using a blind stitch to hold it in place. 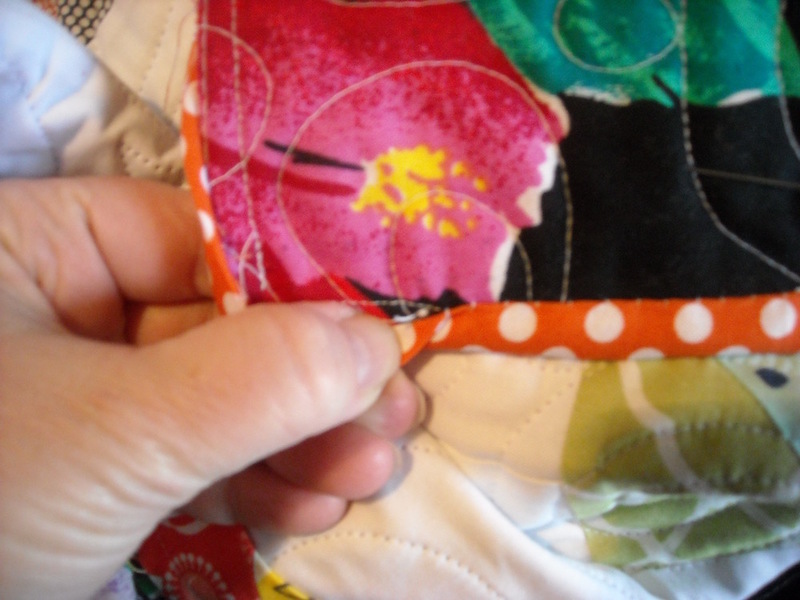 To make a blind stitch, you go down at the same spot you came up, and let the needle and thread travel between the quilt’s layers over to the spot where you want to take the next stitch, which in my case, is just over 1/8″ away from the previous stitch. Then repeat, over and over again! 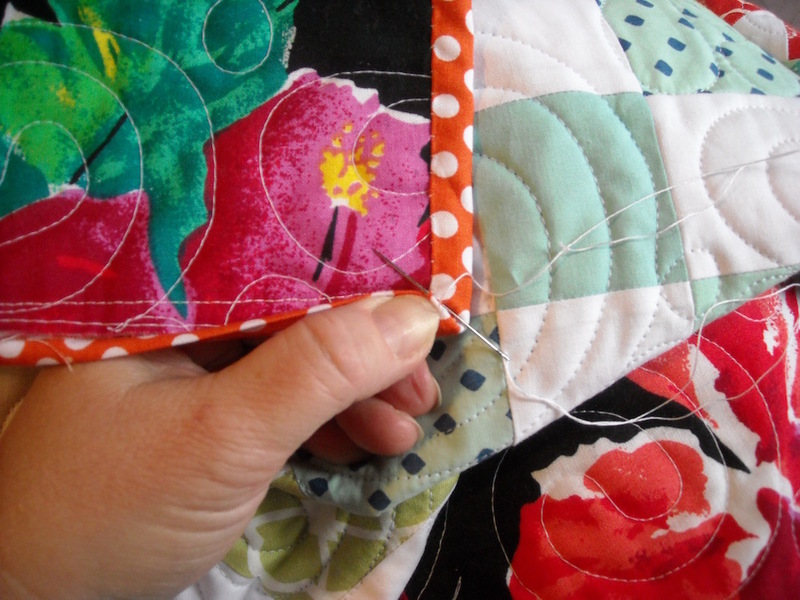 Be careful that the thread does not go all the way through to the front of the quilt — you don’t want your stitches showing on the other side. When I get to the end of the thread, I go into the seam allowance part that gets hidden by the fold of binding, and take several little tacking stitches out there where they won’t show. Then I re-thread my needle, and pick up right where I left off, and keep going. So what do you do when you come to a corner? 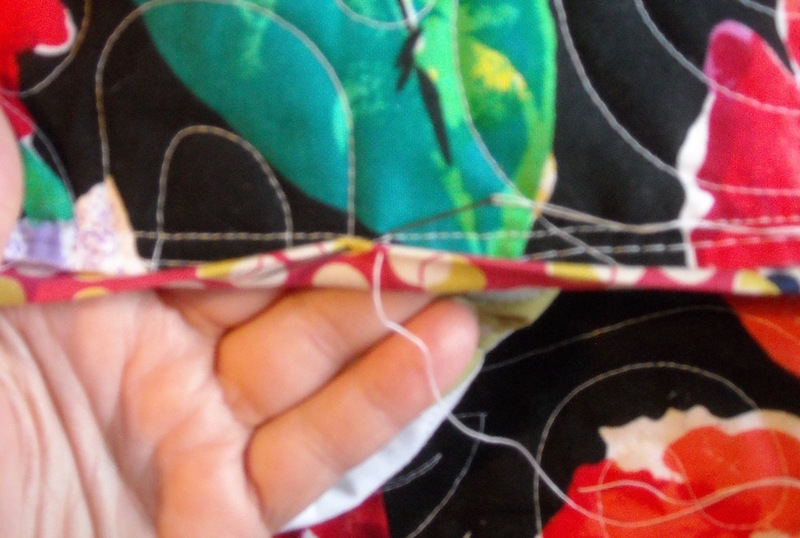 I stitch right up to the corner, then take one tacking stitch right in the corner (where the stitching lines meet). 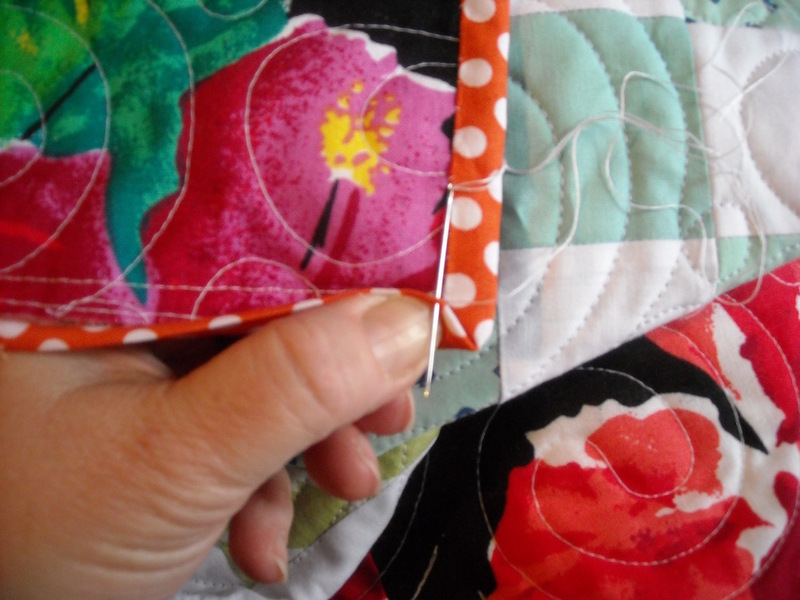 Then I turn the quilt, and fold the next side up over that first fold so that it makes a nice miter. And take one stitch there to hold it in place. 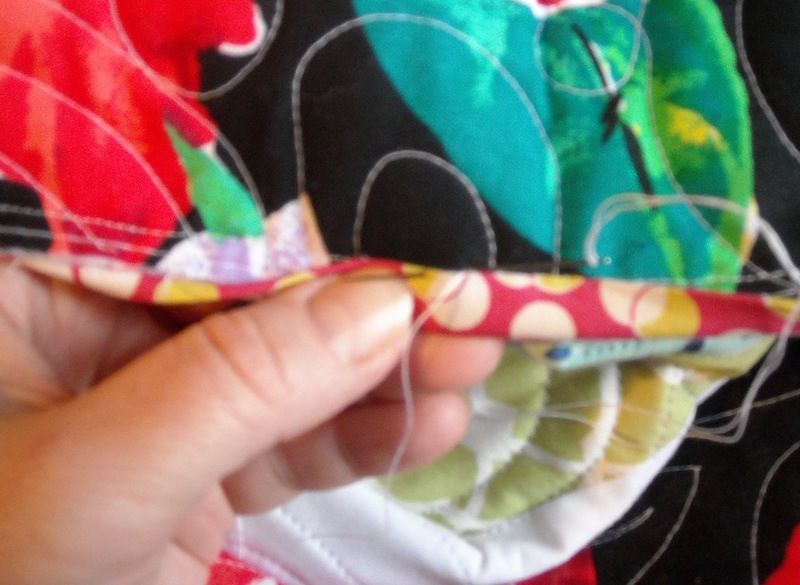 Then I slide my needle along the inside of the fold and push it out at the outer end of the fold. 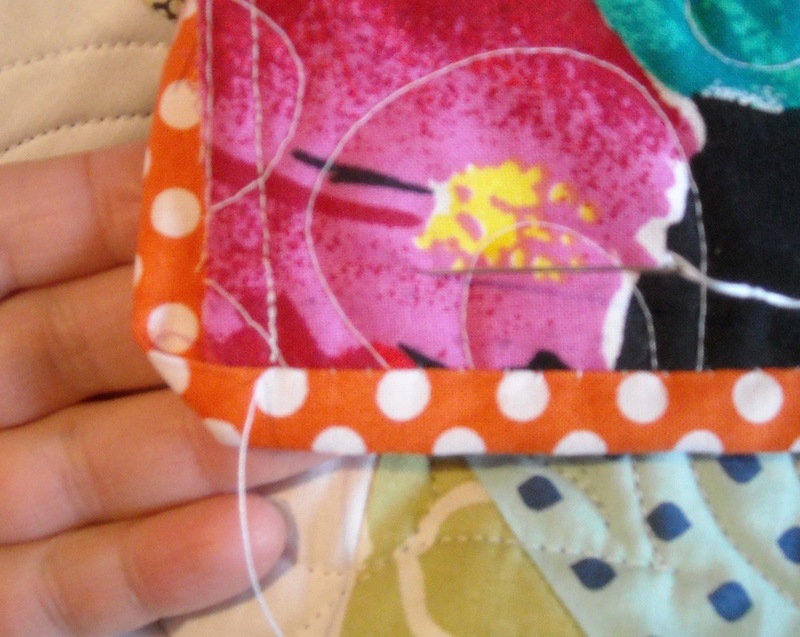 Then continue stitching on down the next side. Just repeat this around the entire edge of your quilt — it’s that easy! When you get back to where you started, just take a few tacking stitches where they won’t show and bury your thread tail in the seam allowance and clip off the excess. But even with that, you’re not completely done. Oh, no . 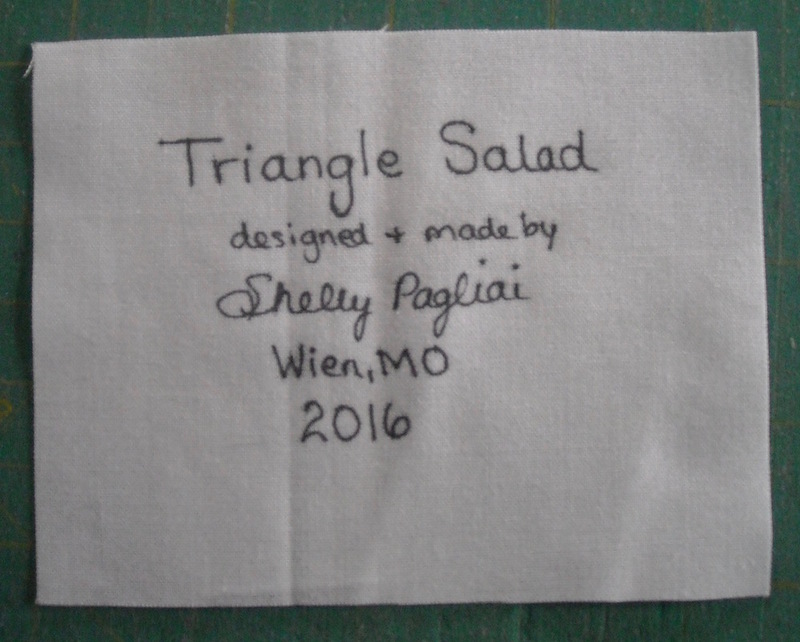 . . your quilt still needs a label. So I’ll show you how I did mine. If my quilt had a white backing, I’d simply take my fabric marker and write directly on the backing of my quilt. That’s the easiest way I know to get that information on there. But since this backing is wild and dark, there’s no good place to write, so I made a label with white to sew on top of the backing. I cut a rectangle 3 1/2″ x 4 1/2″. Then I wrote on the information I wanted to include. Then I trimmed the extra off the label so that my writing was centered. I think it ended up 3″ x 4 1/4″. You can make yours as large as you need it so that it can contain all the information you want to include. 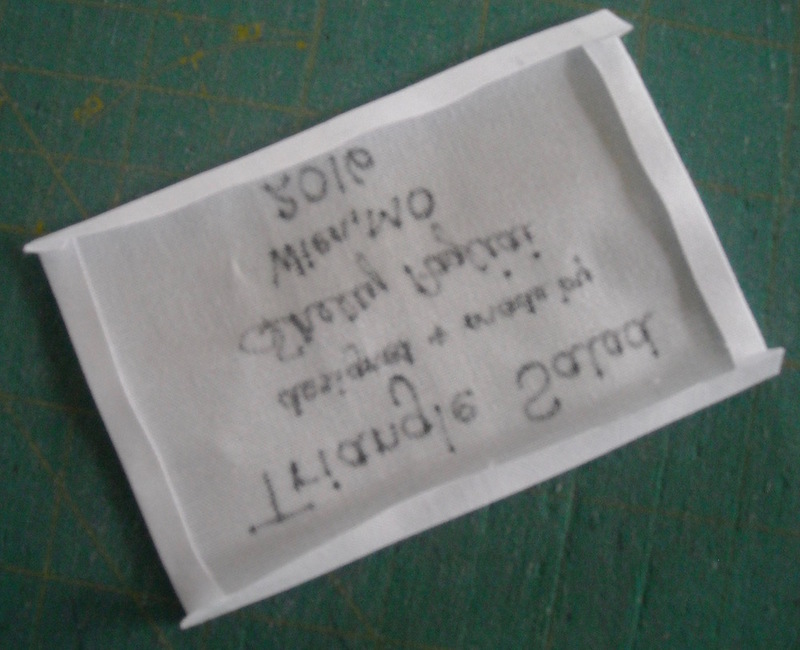 Then I pressed under 1/4″ on each side of the label. The heat from the iron also helps to set the ink from the marker. Then I pinned it on where I wanted it. 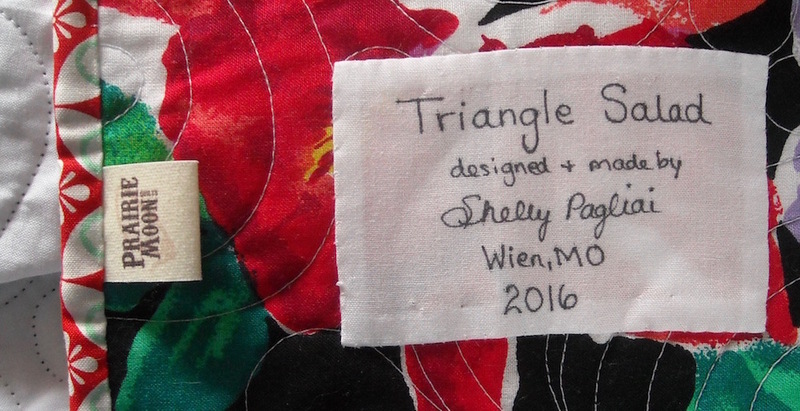 I also have these little foldable tags that can be sewn into the binding, so whenever I make a quilt of my own design, I add one of these. I got them on Etsy. Then I just appliqué my label down. 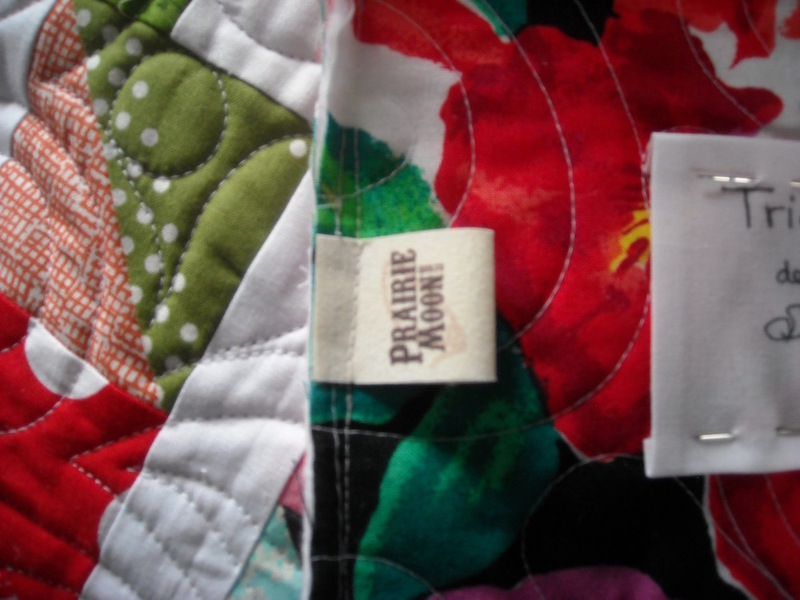 The binding covers the loose ends of the foldy tag. 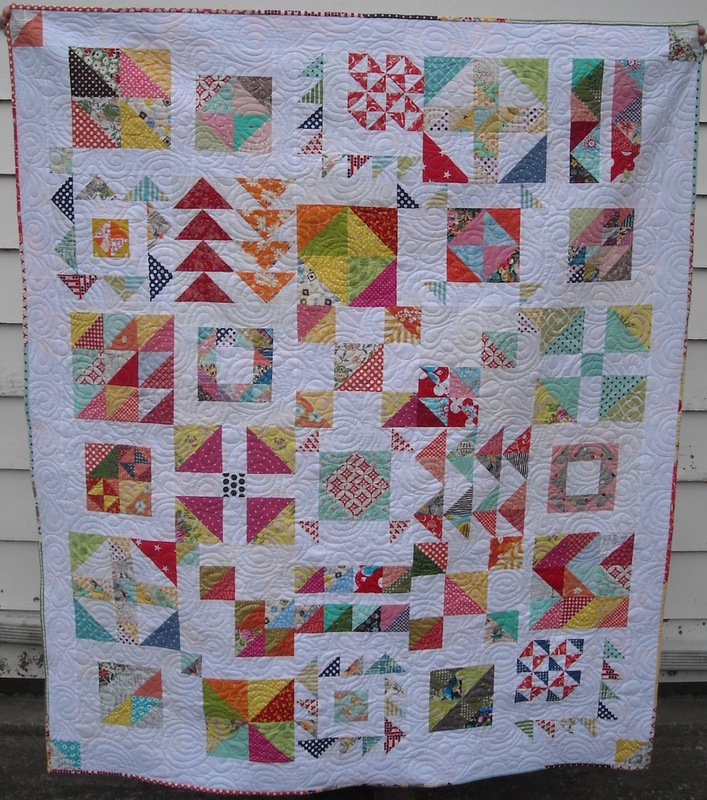 And then you can call your quilt finished! Here’s mine, all finished. I swindled My Cowboy into holding it for me — the hard part was finding a place where it wasn’t crazy windy — it IS March, after all! 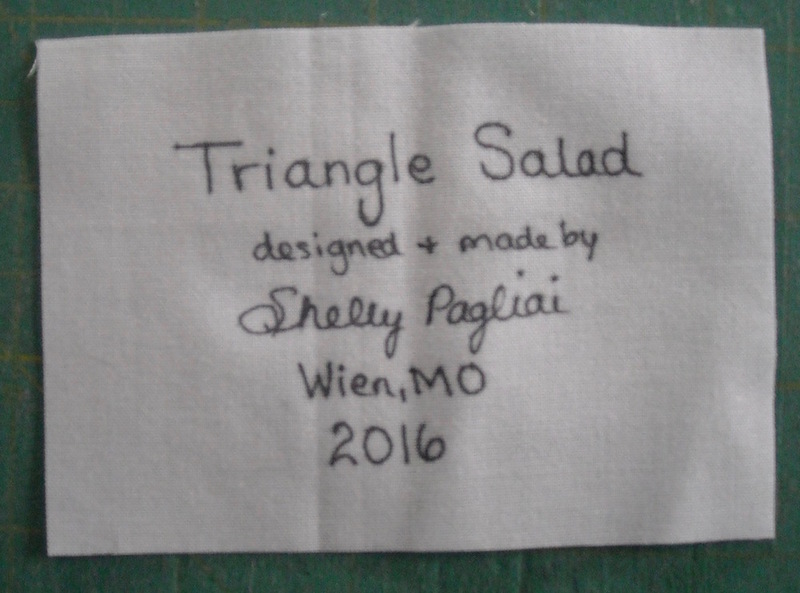 This is the last post for the Triangle Salad Quilt-Along. I hope you had fun triangling along with me. 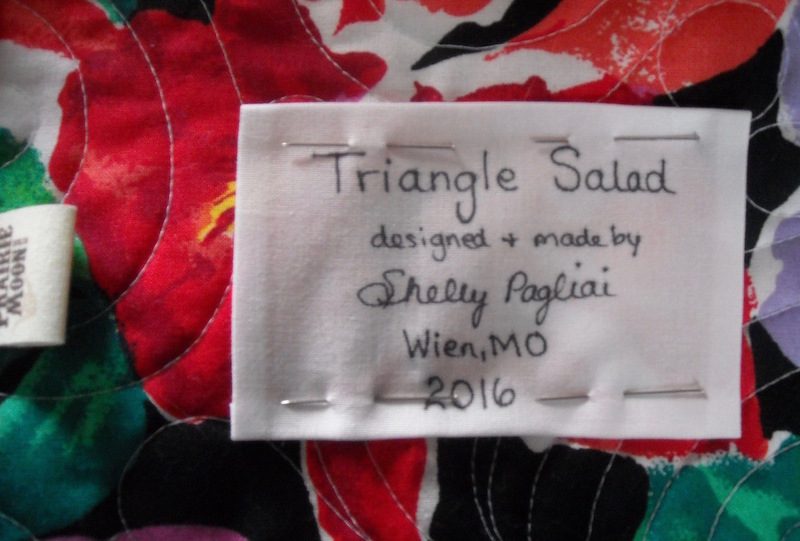 If you made a Triangle Salad quilt, I’d love to see it. And I might even get my act together enough to feature some of them here on the blog if you send me pictures! As always, there is more stuff coming up here on the blog. I’ll have some more Hazel stories and pictures, news about the upcoming book (it’s getting so close! 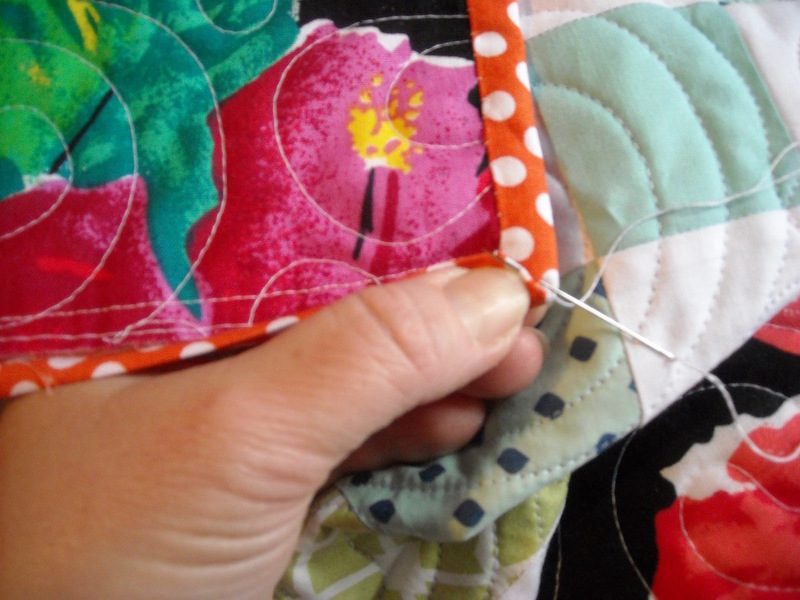 ), and an announcement regarding what the next Quilt-Along will be. So stay tuned!